Ask fellow campers about "Prophetstown State Park" and nearby attractions. 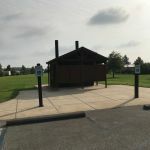 This was our first time staying at Prophetstown, we've been to the park and the nearby battlefield before but not the campground. We'll definitely be back if we can get a spot; the CG fills up a year in advance for most summer weekends so plan accordingly. Book FAR in advance for summer weekends We stayed in the full hook up (Spruce) loop where the sites are more shaded and private. The electric (Savanna) loop is open with beautiful views of the prairie grasses. 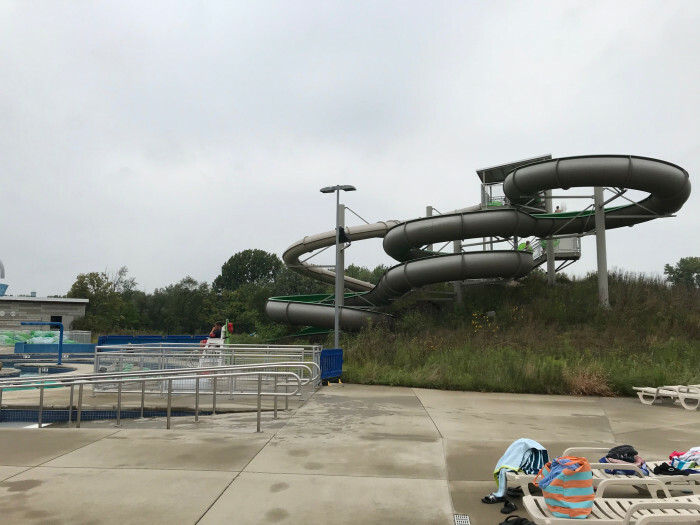 This park is a gem in north central Indiana and has a ton to offer. Paved biking and hiking trails, well-maintained grassy hiking trails, a water park, fishing pond, Native American museum, working historical farm, activities at the farm and museum. We only stayed 2 nights and would have loved to stay longer. We went to the water park which was $5 per person. It's on the small side but does have 2 fast & fun water slides, a lazy river, shallow zero-entry wading area, volleyball net, and a splashpad. To enter the park, there is a daily fee and for us (we are out-of-state) it was $10 for the weekend because we were camping. DNR regularly patrols the campground. The sites and bathrooms are the most maintained I have EVER seen at a state- or government-run facility. 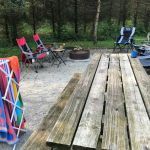 Grass was cut, fire pit was clean, and the crushed gravel site was combed free of debris for our arrival. I saw no garbage of any kind anywhere. Very, very clean! The site was level as they all appear to be. It rained quite a bit the first night we were there and the site drained perfectly, no pooling of water. Can't wait to go back! We camped at Prophetstown State Park in a Travel Trailer. Exit to the park, off of 65, has numerous gas stations and fast food places. Nice and spacious diesel/truck island at the Speedway. Probably the best designed campground (state park, private, or national park) that we've visited. Nicely spaced with gravel pads that allow water to drain. Wooded sites are cozy and private. Easy for big rigs to navigate. Very quiet, occasional train and a little traffic noise. Plenty to do between hiking, biking, and water park. Plenty close to Purdue University. Would definitely stay again. 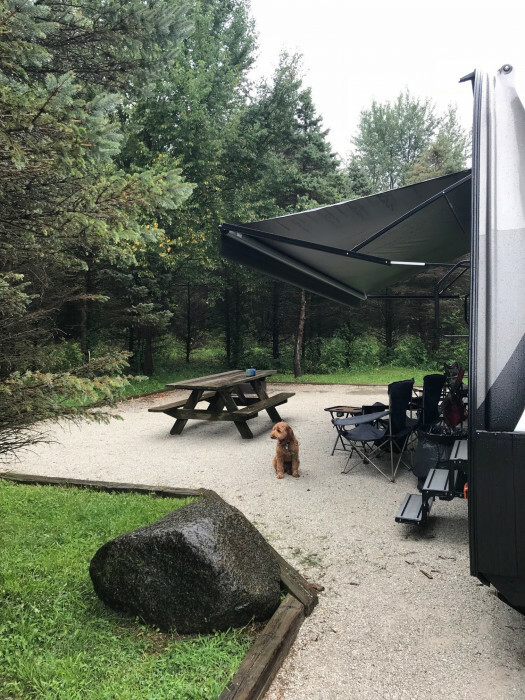 We camped at Prophetstown State Park in a Fifth Wheel. Some sites are 'buddy sites'; unless you want a close neighbor, don't choose a buddy site. Beautiful park, once you take the long drive to get through it. Our site was a long and level pull thru with good hookups (except our site 108 had a sewer pipe about 8 inches high - tough to make water run uphill!). FHU section had several empty sites and the electric only sites were barely 1/4 taken. Our only other complaint is the location of box to deposit hang tags when exiting. It is low for cars/trucks but, if in a motorhome, one has to get out to deposit tag. Good friendly staff and glad to see they enforced one vehicle per site rule. There were many parking spaces in lots. We would definitely return if in the area. We camped at Prophetstown State Park in a Motorhome. Nightly rate includes the one time $10 fee to enter the park. Our site included full hookups. There are also sites with electrical only. There is one bathhouse with showers and flush toilets at one end of the campground and pit toilets in the middle. The site was spacious and extremely level. We were there on a weeknight before school was out so the park wasn't very crowded. With a waterpark inside the park I can imagine that it is packed during the summer. The only downsides were there were a lot of flies and the entry fee on top of the camping fees. This was an overnight stop and we would camp here again. We camped at Prophetstown State Park in a Tent Trailer. We love this park. Been there several times and always very nice. We camped at Prophetstown State Park in a Travel Trailer. Beautiful campgrounds. Nicely groomed trails Spacious lots. Easy access. We will definitely be coming back to this one! 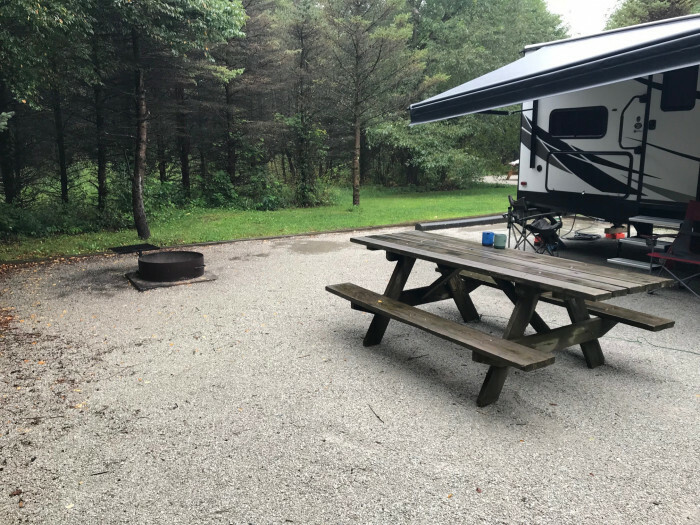 We camped at Prophetstown State Park in a Fifth Wheel. Very nice RV park. Sites are gravel and level. On the full service side of the park the sites are very private with trees between each site. On the electric only side of the park the sites are more open but are still very level and spacious. Access roads are well laid out and easy to maneuver, even with a larger RV. 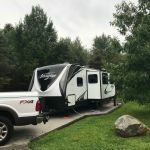 Only negative is that the back-in sites would only accommodate my fifth wheel (40') and I had to park my truck in one of the nearby parking lots. 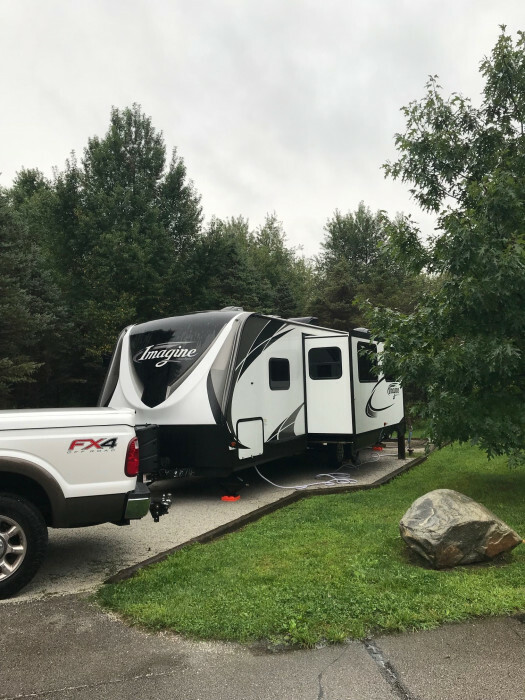 We camped at Prophetstown State Park in a Fifth Wheel. We have been traveling full time for 7 months and this is definitely one of our favorite spots. We only stayed two nights but wish we could have stayed longer. It is a beautiful state park that is clean and peaceful. there are lots of trees and enough trees and bushes between sites that it feels very private. We were in a pull through that was over 80 feet long and level. Our site had full hookups with 50 amp. There is a large cement patio and a picnic table. There is another area that is 30 amp. 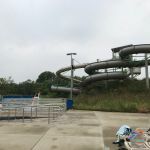 This is a large park and from talking to others, it's very full in the summer months when the water park is open. The whole park is well maintained and clean. There are basketball areas, picnic area, an old time farmstead, bike paths and hiking paths. The park is right outside Lafayette/West Lafayette. The only downside is that you have reserve your site through Reserve America and they charge an additional $5.00. I hate using them but there is no other way to reserve a site. 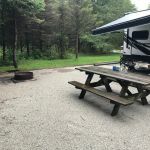 We camped at Prophetstown State Park in a Fifth Wheel. We were very pleasantly surprised by this park. The sites were graveled, level and spacious. They were open, yet there were trees between each campsite affording some privacy and shade (at least in summer months). The bath house wasn't open yet but the vault toilets were clean. 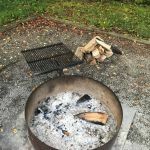 We camped at Prophetstown State Park in a Motorhome. We went to see the Russian Bomber Watchtower nearby. Great state park. I still cringe at the playground area walkout area which has trees and shrubbery up to the road, a tragedy in the making since drivers cannot see kids exiting this sidewalk exit spot. Complained about it last year to no avail. We camped at Prophetstown State Park in a Motorhome. Brunos pizza in west lafayette. TC's in battleground for great meal. The park was more beautiful than we were expecting, based on reviews. We were in a beautiful long pull through, very private on both sides. Tons of walking and biking trails. The staff was very nice. We will return and spend longer next time to see the area! This was just a one nighter - we were able to stay hooked up with no problem. Huge area for a "patio". Site was fairly level, with fine gravel. The Savannah loop is much more open - no real trees, and electric only (no water or sewer). Huge spots (back in only). I would want the Spruce loop, but families might want the other for the space. They have potable water available on the way in, and dump stations on the way out. The bridge outage was a little hairy (it's pretty narrow) but not a real problem. We camped at Prophetstown State Park in a Travel Trailer. Spent a week and thoroughly enjoyed ourselves. The site was very private with tall pine trees on three sides and well separated from the other sites. Our site was level side to side with a slight slope to the rear, which proved useful during a few heavy downpours of rain. This campground has a decidedly "un-Indiana" feel due to all the pine trees. Very few lights at night which added to the ambiance. The host site had firewood available 24/7 via the honor system, and the hookups were maintained and worked flawlessly. At&t cell service was mediocre; over the air TV netted us 5 channels. There is no camp store. The restrooms were well cleaned with the exception of the showers. Although the showers were far from dirty, we noticed the same residue and light trash in the stalls and on the drains for a couple of days. There's also a family restroom that includes a shower. We visited the aquatic center and had a great time. The entry fee is $5 each and afforded us hours of fun for all ages. The aquatic center has free locker use, a concession stand with hot dogs, burgers, etc. and plenty of shaded areas. We noticed a decline in the condition of the farm compared to our previous visit in 2007. Nonetheless, everything else ensures that we will happily return to this park. We camped at Prophetstown State Park in a Travel Trailer. Visit nearby Battleground and the Tippecanoe Battle site. Also, Fair Oaks farms is about 40 minutes away and while pricey, it is family friendly and you can easily spend an entire day there. 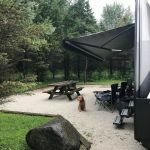 Excellent State Park - 2nd visit now Most recent stay was June 6h 2017- I'm "late" in posting my review ~ We camp in a "Tear Drop" style RV only 15' long w/o toilet or shower ~ plus we like to eat outdoors using the picnic table and set up our dining canopy for sun and weather protection and thus rely on condition of campgrounds facilities and being nearby our site ~ so our critique is focused in that area Liked our site #210, (electric only) was in newer section of park right next to restroom albeit it had no shade trees unlike the older section that did. Modern restroom/shower building; very roomy with ample number of stalls with full tiled walls was clean and well kept. Each stall had bench in changing area and ample hooks for towels and clothes. Nice conveniences but it would be nice if there were rubber floor mats as you exit shower to keep feet off wet floor. Communal sink area had shelves for toiletries beneath each mirror but no hooks for hand towels and no paper towels for cleanup after use leaving sinks somewhat messy. 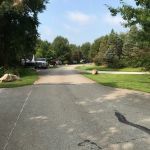 Overall grounds were well cared for; grassy areas surrounded sites that were large and flat with gravel and level and good distance way from neighboring sites. Minimal vegetation between sites for privacy but time will tell. This state park gets a high rating and will return when in the area. 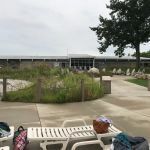 We camped at Prophetstown State Park in a Travel Trailer. Nice, out of the way kind of park. Spot was a pull thru with full hookups, plenty big enough. Quiet as all get out. Will stay here again. We camped at Prophetstown State Park in a Motorhome. Great campground. Site was packed gravel, very large and level. Vegetation between sites made it very private. Utility hookups were in great condition. The sewer hookup was in very back corner and I did not have enough sewer hose to reach, but no big deal as we were only there 2 nights. Loved the 3+ mile paved bike trail. Very helpful and friendly staff at the check-in station. 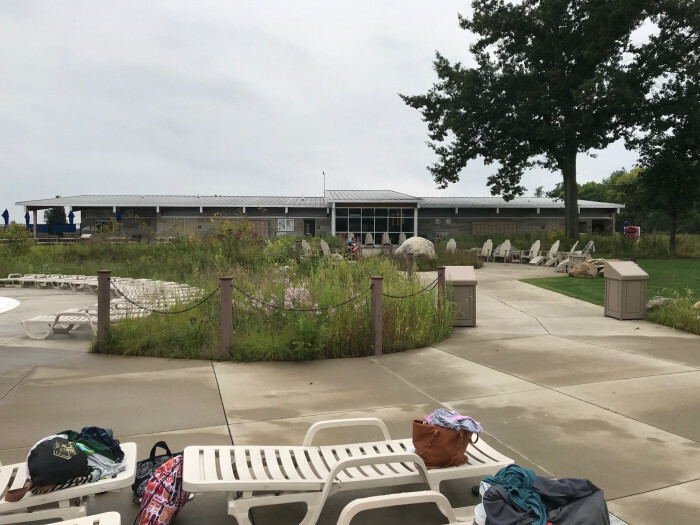 This is a fairly new state park built mostly in an open prairie, so much different scenery than many of the Indiana State Parks we have camped in. This is a top notch state park and campground. Please note when making reservation that the full hook-up sites are much more private than the electric only sites. Will return next fall. We camped at Prophetstown State Park in a Motorhome. Shopping and restaurants are an easy 10-15 minute drive. TC's restaurant in battle ground good, sunrise restaurant in downtown Lafayette good as well as several eateries downtown. Purdue salvage (west Lafayette) is an interesting diversion for you pickers out there. Since we were only using park for a night we did not leave the park. The Tippicanoe Battleground State Memorial and Museum is close to the park, as is Wolf Park, a wolf rescue preserve. Purdue University is close by in West Lafayette and plenty of shopping can be found on the east side of Lafayette between US52 and I65. Are you affiliated with Prophetstown State Park ?